Businesses of all sizes are faced with the challenge of managing huge volumes of data that are becoming increasingly valuable. But storing this data can be costly, and extracting value from the data is becoming more and more difficult. IT organizations have limited resources and cannot afford to make investment mistakes. The IBM® Storwize® V3500 system provides a smarter solution that is affordable, simple, and efficient, which enables businesses to overcome their storage challenges. 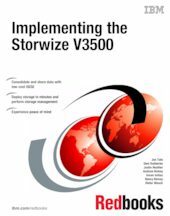 IBM Storwize V3500 is the most recent addition to the IBM Storwize family of disk systems. It delivers easy-to-use, entry-level configurations that are specifically designed to meet the modest budgets of small and medium-sized businesses. - Consolidate and share data with low cost iSCSI storage networking. - Deploy storage in minutes and perform storage management tasks quickly and easily through a breakthrough graphical user interface. - Experience peace of mind with proven IBM Storwize family high-availability data protection with snapshot technology and IBM warranty support. - Optimize efficiency by allocating only the amount of disk space needed at the time it is required with high performance, thin-provisioning capabilities.